A while back I’ve spoken with Jacco Landlust and he told me about the Network Connection Filter feature of Oracle Weblogic. I was interested about this feature and decided to look into this. Network Connection Filters (filters from now on) are a sort of firewall/acl feature that can be used to allow or deny access to servers in your Weblogic domain for certain protocols and network addresses. The example that Oracle mentions themself in their documentation is to restrict access to the Administrator Server to prevent unauthorized access.But another example could be to allow access to your application/services from only a specific range of addresses in your company network. 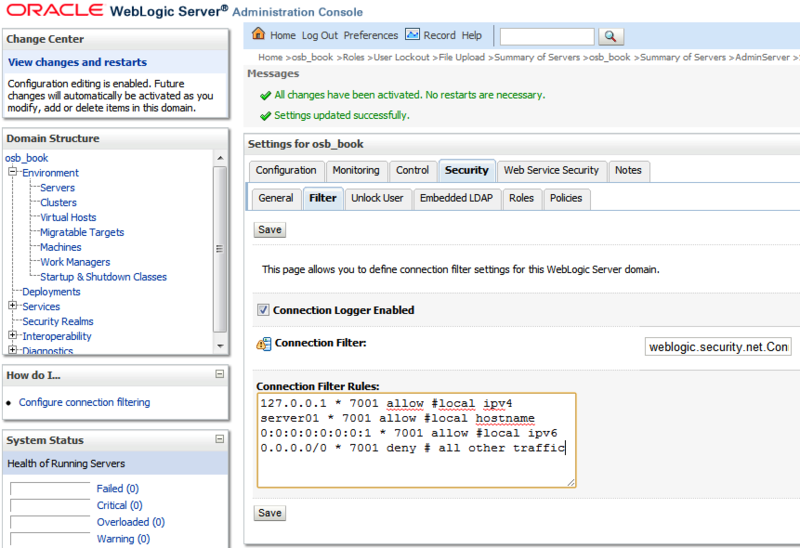 You can find the configuration of filters in the left menu of the Weblogic Console under domain. Then go to Security -> Filter . Rules are validated top -> down, so the 4th line will deny all traphic (0.0.0.0/0) to all local addresses (*) on admin port (7001). So only if the first 3 rules are valid then access is granted, which in the example only applies to access from the local machine. Filters are activated to all servers in your weblogic domain, so remember you can lockout yourself (admin console) or even internal weblogic communication between managed servers and the admin server. Testing with filters i came to the conclusion that it’s actually a very nice feature to easily and quickly upgrade the security of your Weblogic domain. If you have a hardware firewall in place to prevent access from unwanted users in your network that would off course be even better. Otherwise I would probably want to implement such a feature in every production environmen I would be responsible for. I got locked out and WLS won’t even start…where is this config file where the connection filter information is stored? The weblogic config.xml is located in your domain folder. p.s. By default this folder is located in your /%WLHOME%/user_projects/ folder but you can alter this during install. Does filtering also work for outgoing connections? If not, how could I restrict Weblogic from accessing a certain host or IP? It’s been a while, but I believe filtering only works for incoming communication to your admin/managed servers. Simply working as a sort of ACL. For outgoing connections you might have to look to your (operating system) firewall ?